I really only deep fry once a year. Yes, I run a baking blog, which isn't the healthiest of places, but deep frying is the special kind of indulgence that I can only allow for the holiday of Chanuka. So when it's this rare, I have to make it memorable. Enter mini cream-filled French beignets. In the past I've made doughnuts, both cake and yeast-raised, and also experimented with apple fritters. But this year I had a hankering to try out a New Orleans classic: French beignets. Beignets are different from doughnuts in that they are square and do not have a hole in the middle, and they are never frosted, but are instead topped with copious amounts of powdered sugar. To up the indulgence level, I filled them with fresh cream, which is a perfect balance to the chewy, yeasty fried bites. If you're new to deep frying, a couple tips: As terrifying as it sounds, I actually recommend frying in shortening, for one simple reason - since it is solid at room temperature, your doughnuts will be less oily in touch and texture when they cool down. You certainly don't have to use shortening, and since it isn't widely available in Israel I used canola oil. I recommend using a thermometer when I deep fry so I can always know the temperature of the oil for accurate baking. If you really don't want to invest, you'll have to make test fritters to see how quickly they cook. Keep in mind that the oil temperature will rise and dip throughout the cooking process. I also recommend some all-metal tools - preferably tongs and a small sieve to remove the finished sufganiyot. And as always: safety first. Lower things gently into the oil, never drop them in to allow hot splashes, and always have the pot handle turned in toward the stove so you can't accidentally knock it. Mix together the milk and yeast and in a large bowl, let stand 10 minutes until bubbly. Add in the sugar, eggs, melted butter and salt and whisk until combined. Add in the flour and using your hands, a wooden spoon or a dough hook mix until it comes together into a dough. Continue to knead until no longer sticky, adding in flour as necessary, 5-10 minutes. Place the dough into a lightly oiled clean bowl, cover with a damp cloth and let sit for at least 40 minutes at room temperature until doubled (if your kitchen is cool, it may need longer). Heat the oil or shortening in a deep pot to 325 F.
On a well-floured surface, roll the dough out into about a 12" square. Using a pastry/pizza cutter or a sharp knife, cut into 1" squares. Lower about 6 squares at a time into the hot oil. Let cook about 1-2 minutes on each side, until well browned, before flipping over to cook the other side. When done, remove to a paper-towel lined plate. Whip the cream until stiff. Use a small knife to make a small hole in the side of each beignet. Fill a piping bag with a small metal tip with the cream, then pipe into each beigent until full. Douse generously with powdered sugar and serve as soon as possible. *Note: How you go about this recipe will depend on the type of yeast you use, which will likely depend on where you live. I wrote the recipe for active dry yeast, which is the most commercially available type in the US, where most of my readers are based. If you live, like I do, in a place where instant dry yeast is sold, you skip the yeast proofing step entirely. Instead, add the yeast to the flour, using the flour as a buffer between the yeast and the liquids, then mix everything together. I'm far from the only one getting in the Chanuka spirit today, on the second day of the holiday. 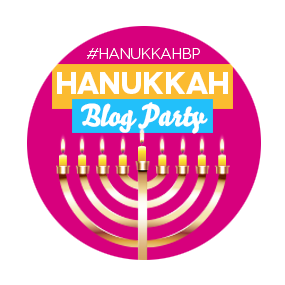 Here are some other bloggers participating in our Chanuka blog party organized by Leah of Cook Kosher and Miriam of Overtime Cook! Be sure to check out some of these tasty looking links - plus many of them are participating in a fun cookbook giveaway. nom nom nom. I love beignets! I will deep fry anytime. So glad you joined the blog party – can’t wait to see how you used the printables to decorate your home! Shelley from The Kosher home! Tres Chic... a nice change up from sufganiyot! I LOVE beignets -- but am not brave enough to make them myself. Thank goodness for more experienced cooks in my family who DO make them. These look absolutely delicious. Definitely putting me in the deep-fried dessert mood! You're really lovely to be only baking them once a year - I think I'd be baking them once a week! I love any sort of doughnut. This look delicious. Looks good! Thanks for the frying safety tips -- I burned myself this week with a hot splash of oil, trying to make sufganiyot. These look yummy. And I love that they're squares, so you don't have to cut out rounds and reroll scraps.